Checkout, or clone, URLs at the top of the page for a Fisheye repository allow users to easily clone the source for the repository. Repository defaults allow you to control configuration aspects for all repositories in the Fisheye instance together. To control the display of the Checkout/Clone button, go to the admin area and click Defaults (under 'Repository Settings'). This setting is overridden by the configuration for specific repositories (described below). 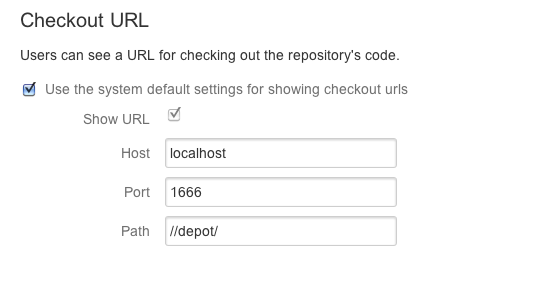 To configure the Checkout/Clone button for a specific repository, go to the admin area and click Repositories (under 'Repository Settings'). Click the name of a repository in the list and then SCM Details in the left-hand nav panel. The available fields under 'Checkout URL' at the bottom of the page vary according to the repository type (for example Git, SVN or Perforce), but Fisheye will prepopulate fields when it can determine values that are useful. You may wish to alter the values suggested by Fisheye if you want users to access a repository in a different way from that which Fisheye uses.